Sea, Sand & Sky: Carson Beach. From Algae to Zumba. Carson Beach. From Algae to Zumba. I know this may come as a shock to most of you out there in the blog-o-sphere but despite my loud voice and awesome marine fun facts there is one thing that I have struggled with throughout my life. A hardship that I have tried with no avail to over come for years. I am admitting this now for everyone to read: I can't dance. I know, I know, you're probably asking yourself how this could possibly relate to the Carson Beach Reading Night event that I just attended, so I will get to that. This evening started out like any other. With our blue polo shirts on, and with smiles on our faces we packed up a cooler of critters and set out to the Carson Beach Reading Night event in South Boston. 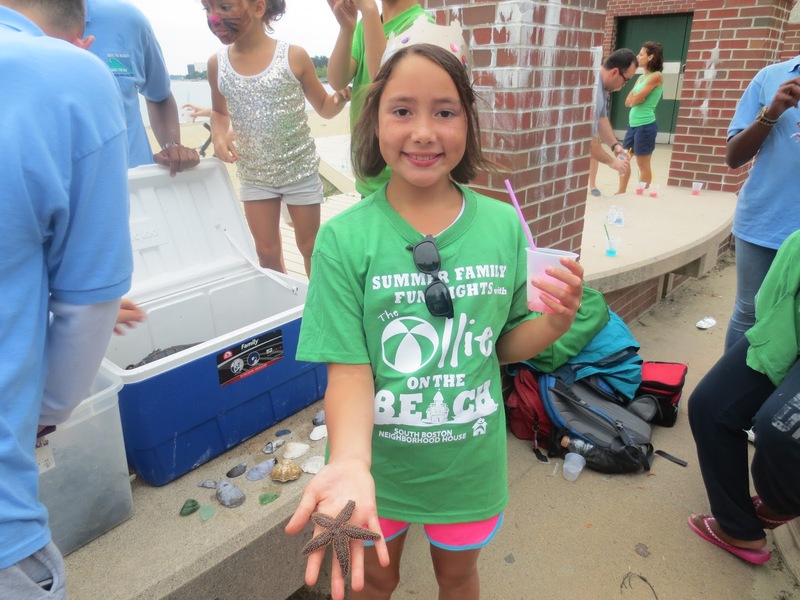 Upon arrival we set up our Save the Harbor touch tank and we were an immediate hit with the children of South Boston. From playing with the algae in our touch tank to cuddling up to Larry the Lobster, a good time was had by all. Some kids even had to be dragged away by parents in order to move on to the next activity. The highlight of this touch tank was without a doubt when a young boy with awesome dragon face paint on stood front and center and asked me every single question he could think of about the critters in the tank. With his mom standing behind him she said, "Tell STH what you want to be when you grow up". Now most kids at the tender age of four dream about becoming firemen or astronauts or pop stars, but this kid was something special. With a mischievous grin on his face he looked me right in the eye and said "I want to be a Marine Biologist". 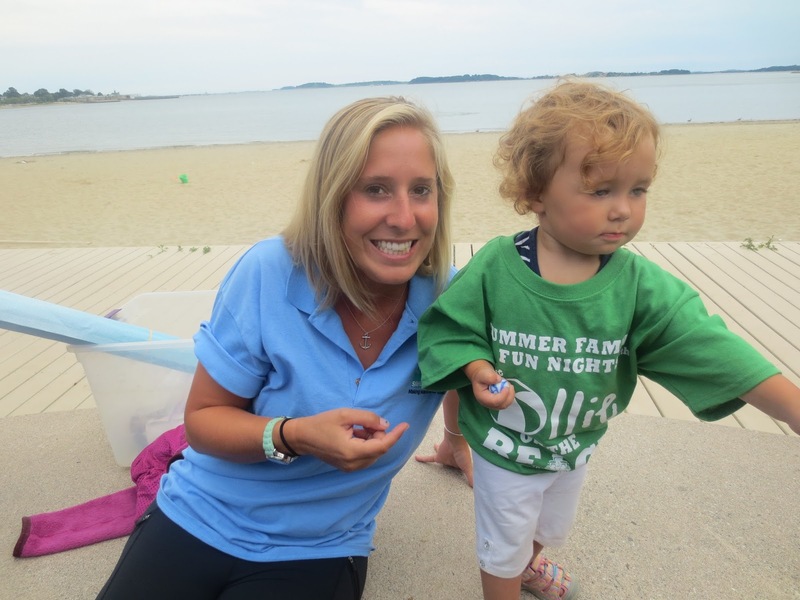 I can see this young boy in 12 years wearing one of our STH blue polos and inspiring the next generation of Save the Harbor advocates. 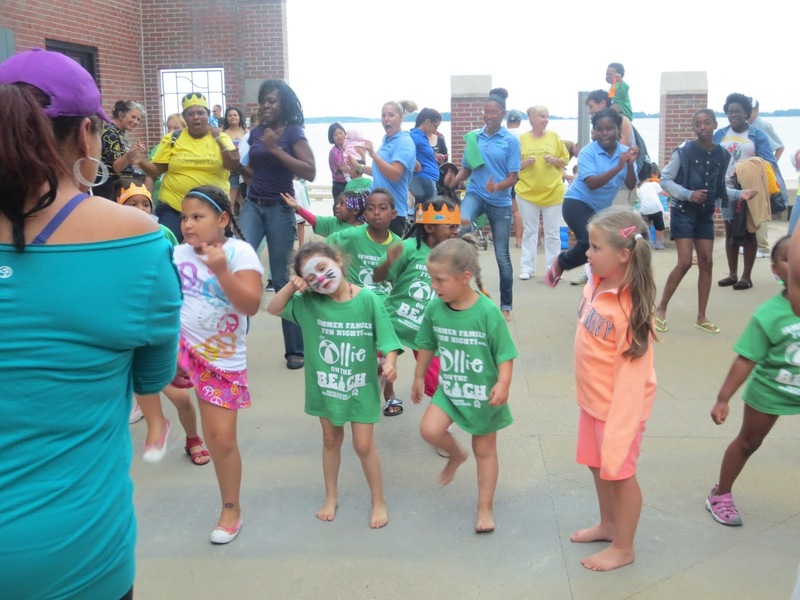 As the event picked up a Zumba instructor put on some loud music and the dancing soon began. Kiauna and Myriam, my JPAs, seemed to have the same idea at the same time. Without giving me a moment to think they took me and dragged me to the Zumba dance floor. We tried to blend in the best we could with the rest of the members on the dance floor to no avail, as we stood at least two feet taller than the 20 or so children of South Boston partaking in the festivities. In no time the three of us, in our matching blue polos, looked as if we could have been the back up dancers in Beyonce's World Tour. Okay, maybe that was an exaggeration but it felt good representing STH at this event, whether it was joining in the dancing class, or at the touch tank, the STH team was definitely a positive force to be reckoned with at the Carson Beach Reading Night.